reliable over time and efficient! Our electric radiators dedicated to indoor heating are manufactured in our Austrian factories (more than 30 years of existence). 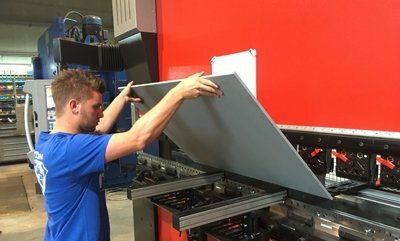 Our infrared radiators dedicated to outdoor heating are manufactured in Germany. Making radiators is not as simple as it would seem when the goal is to provide a low-energy, reliable, long-term heat source. Year after year, DEGXEL radiators are constantly improving and become more efficient. We are today at the European top in terms of energy efficiency (i.e. in low consumption). 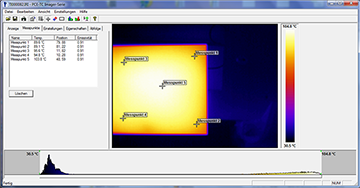 The infrared emitters used in our radiators are at the top of current research. Our radiators meet and exceed European standards (2014/35/EU (LVD), 2014/30/EU (EMC), 2011/65/EU (ROHS), EN 60335-1: 2012, 2013, EN 55014-1: 2006, EN 55014-2: 2015, EN 61000-3-2: 2014, EN 61000-3-3: 2013). Our radiators are certified by the German organizations TUV (No. 1111209907) and GS. Our production plants are certified ISO 9001. 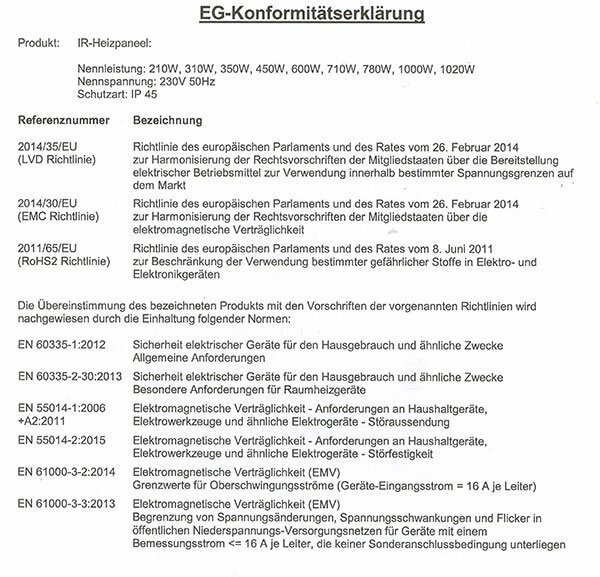 We benefit from the labels “Made in Austria”, “Made in Germany”, ROHS compliant (environmental standard), IP45. Our indoor and outdoor radiators are Class 1 electrical appliances. Compliance with these standards guarantees our users total safety in the use of our radiators. The materials used in our radiators originate exclusively in Austria, Germany and Switzerland. Our choices are always guided by the reliability, efficiency and durability of our heating systems. Year after year, research and development teams are implementing increasingly efficient technical solutions which the main aim is to improve the radiant power delivered by a given radiator surface. We provide some of the most compact electric heaters on the market given the radiation efficiency. In fact, the excellent surface power of our radiators allows users to heat their homes with average power of 50 Watts to 55 Watts per m2. Your room is 10 m2, you will need only 500 watts with a DEGXEL radiator (see our online power calculator). Most electric heaters on the market use conventional technologies that require on average 90 to 100 Watts per m2. The British electricians have the habit of taking 100 Watts per m2 as a reference. That’s nearly double. The power of an electrical appliance directly reflects its consumption. Whether it is a vacuum cleaner or a radiator, the 500 W of your device will correspond to your consumption. Find out more about the electric consumption of radiators DEGXEL. Our radiators are distributed in 18 European countries and gradually spread to other continents: Austria, Belgium, Croatia, Denmark, England, Finland, France, Germany, Hungary, Italy, Luxembourg, Netherlands, Norway, Poland, Slovenia, Spain, Sweden and Switzerland. If you have a request in one of these countries, contact us. We deliver to our European (professional or private) customers under2 to 3 weeks maximum depending on the radiator models. Our radiators are guaranteed 5 years (see product sheet) and are made for lasting 20 years. They are supplied by default with a manual in English and a wall or ceiling installation kit. 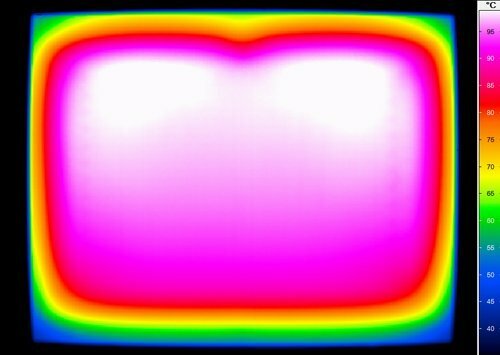 Infrared thermal camera analysis report (after 4 minutes, then after 30 minutes): the rise of temperature is very fast, synonymous with high efficiency in the surface emission. Then after 30 minutes, the temperature is homogeneous over the whole surface, which is optimal for the heat emission in the room. Source: University of Stuttgart (2016). Why is the radiation rate so important? Many manufacturers communicate on the performance rate of the radiators, which approaches the 100% whatever the marks (the principle of the electric efficiency). The power of an electrical appliance should mandatorily appear on the nameplate. Whether it is a vacuum cleaner or a radiator, your consumption will correspond to the power of the appliance relative to the duration of use. The problem is that this data is also not sufficient to compare electric heaters with each other! Indeed, two radiators of 1000 Watts will not ensure the same comfort, nor the same speed of heating. 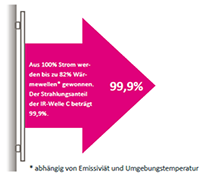 So, in the end, 2 radiators of 1000 Watts will not have the same consumption. Indeed, an effective device will only work 5 hours per day, when another will need to heat 10 hours, with uneven comfort! Consequently, if the legislation does not oblige manufacturers to communicate on truly representative data of heating quality, it will be difficult to compare. The rate of radiation is an essential factor. Combined with the power of radiation (and other factors) it reflects the radiator’s ability to provide maximum thermal energy in the room. The infrared radiators DEGXEL have an exceptional radiation rate on the market> 72% *. Combined with a homogeneous temperature distribution on the radiator front, and especially with the use of high-density insulation on the rear (in order not to unnecessarily heat the back of your wall), our radiators are among the most efficient heat emitters in Europe. It is precisely this radiation rate that allows very low consumption. (*) Note that most manufacturers have less than 50% radiation. 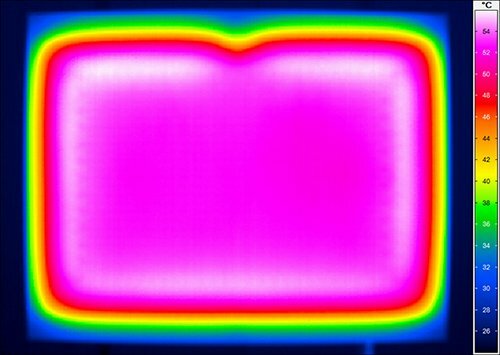 Sometimes much less (10%) when talking about the “radiating” radiators available in mass retail. If a brand announces more than 70% of radiation, ask for the excerpt of the study which confirms this figure! These results (see Stuttgart study – Germany 2016) are due to our company’s determination to use the best radiant materials, without compromising price or quality, as well as the constant search for technical improvements on our products. Our Made in Germany / Made in Austria quality requirement and design engineering enable us to offer highly customizable radiators, through the set of kits and options. Through an exclusive printing process (improved year after year) and unlike many import models, we guarantee a perfect and lasting printing of pictures and finishes of our heaters.